Team Tasker, a family of motorbike enthusiasts, will be attending this year’s Scottish Motorcycle Show as guests of sponsors, Motorcycle Law Scotland (MLS) to talk about having fun and staying safe on a bike. Dad, Peter (53), daughter Sammi (23), son Andrew (25) and team manager mum, Ann, have been involved in motocross and motorbike racing for nearly 20 years and are now a familiar sight on race circuits both here and mainland Europe, with both children becoming championship riders. What started out as a hobby for Andrew & Sammi at the age of six, then extended to the whole family, with Dad, Peter, moving up from team mechanic to racing just last year. He completed his training under the tutorship of Andrew and Sammi, who are both experienced SACU trainers and, at the beginning of the season, all three were racing on the same track together. The Taskers have known and worked with Brenda Mitchell of MLS for nearly 12 years. The connection was first established when Brenda lined up with an 11-year-old Sammi at Knockhill for a ‘ladies only’ track night. Sammi gave Brenda some advice. MLS has been a main sponsor for the family for the past 7 years. The Taskers had an excellent 2017 season that saw them take in three of the best tracks in Europe, Aragon, Portmao and Jerez, as well as racing in Scotland. Sammi raced her Suzuki GSXR Stock 600 in the 'Open' class at the East Fortune opener, qualifying a very respectable 16th out of 38+ Superbikes. She was the only 600cc bike on the grid. Andrew also managed some outstanding times at East Fortune lapping in a 58.3 sec which was under the, then existing, lap record. He entered the Open and the Thunderbikes at the NEMCRC last round at East Fortune in October, winning two out of the four Thunderbike races lapping in an extremely impressive 1.02, and retained his North East Open Championship despite only competing in two out of the three rounds. This year, Sammi and Andrew will be competing in all the North-East Championship rounds starting at Croft on 7th & 8th April. 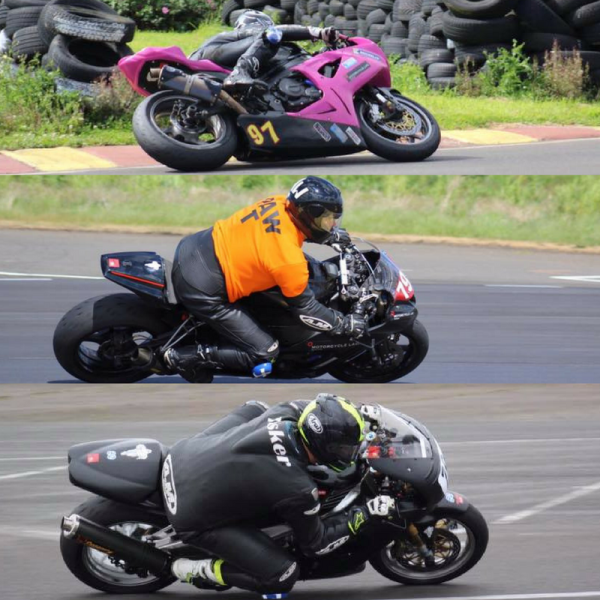 Three riders in five classes: Sammi on her GSXR 600 in the Open, Andrew on his Kawasaki ZX10 in the Open and an Aprilia RSV Mille in the Thunderbikes and finally Peter in both the Open & Thunderbikes. Andrew is also a 'Michelin Power Cup Evo' supported rider this year so will be attending as many of the Power cup days he can. Both Andrew and Sammi are SACU trainers again and will be doing a number of training days, with the SACU planning to run six training events at both East Fortune & Knockhill during 2018.